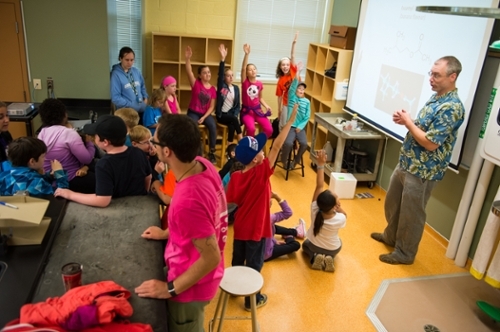 The not-for-profit STEM outreach organization Worlds UNBound received $75,000 over three years from the Natural Sciences and Engineering Research Council (NSERC) PromoScience program on Friday, May 6. Based out of the University of New Brunswick (UNB), Worlds UNBound works to increase the awareness of and interest in science, engineering and technology in a fun and supportive environment through hands-on activities and mentorship. The organization will receive $25,000 for each of the next three years. Project organizer Katie Skead said the funding allows Worlds UNBound to provide more opportunities around the province. “We are using the funding to expand our all-girls programming geographically, to add all-girls robotics and coding camps and to expand our Aboriginal outreach program to reach three communities per year with camps,” she said. Since 1993, Worlds UNBound has delivered school workshops, summer camps, and camps to more than 125,000 youth across New Brunswick. The organization is uniquely positioned to offer critical STEM outreach across New Brunswick, especially to under-represented groups (girls, aboriginal youth, and under-privileged youth). “PromoScience funding will allow Worlds UNBound to add the additional dedicated staff and resources required to significantly expand our girls club, girls camp and our Aboriginal camps. The funding will also allow for more travel across the province enabling us to increase our geographical footprint and bring our girls and Aboriginal outreach programming to more youth,” said Ms. Skead.